Introduction In the UK, a lot of ideas for improving the lot of the disadvantaged has been formulated although the lead is not always maintained. Doctors are believed to be giving their patients euthanasia far too often and the law however takes no perception of euthanasia; whether the motive is merciful or merciless and greedy, the deliberate taking of life is classed as murder. Arguments about euthanasia often hinge on the 'right to life' and the 'right to die'. The first is a widely accepted basic human right and moral value, based on the fact that people generally want to live. But the question is, what should be done to those who are seriously ill or in vegetative state and no longer wants to live? A century ago, most people died quite quickly if they had serious injuries or illnesses. Nowadays they can be treated, sometimes cured, and often kept alive almost indefinitely. Codes of conduct formulated centuries ago, for example the Hippocratic oath, cannot necessarily help us with twenty-first century problems of medical ethics. In this project, I will outline the issues and views from Religious groups, different cultures, and medical opinion on the above. I will follow a survey which will be conducted by the public and will help establish their views. Chapter One Euthanasia and types of euthanasia Euthanasia comes from two Greek words whose literal meaning is 'well death'. Today it is also referred to as 'mercy killing' and is understood as causing or bringing about a person's death painlessly, usually because the person is suffering greatly, terminally or irreversibly ill, severely mentally or physically disabled. (Donnelan 1995). Superficially it can seem an ideal solution for some people with particularly distressing problems, the elderly, and such. Euthanasia is one of the biggest controversies of this decade. It originally meant 'a gentle and easy death' but is now used to mean 'the act of inducing the painless death of a person for reasons assumed to be merciful. ...read more. Every individual is seen as unique not just in a logical sense but also in a special sense defined by his or her destiny. The right to make the ultimate decision of life and death will be vested in the community rather than the individual. Accordingly, the societies have an abundance of both ordinary and special procedures forwarding off premature death. Medical advances in sustaining life have outpaced society's ability to deal with the profound legal, ethical, and moral aspects of issues surrounding euthanasia. The medical profession and the patient's family have been allowed to determine the courses of action for a terminally ill patient who has raised society's awareness and forced it to recognize the ethical and moral implications. The medical profession is split on the legalisation of voluntary euthanasia and a large majority of doctors (60 per cent) say that they would draw the line at assisting the suicide of patients who were severely mentally disabled but not terminally ill. Chapter Five Pro Euthanasia and Anti Euthanasia Issues Very few people in Britain are at either ends of the debate over euthanasia, asserting either a person's right to die at will or a prohibition against being able to opt for death regardless of the circumstances. The vast majority falls in between, supporting euthanasia in certain qualified circumstances. 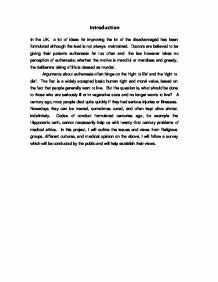 For example is a survey carried out in UK which showed that 82% of people would support a law allowing doctors to end the life of someone with a 'painful incurable disease', up to 75% who took the view about ten years ago. At the other extreme, only 12% think law should allow euthanasia for someone who is 'simply tired of living and wishes to die. 51% would legalise euthanasia for a person 'who is not in much pain nor in danger of death, but becomes permanently and completely dependant on relatives for all their needs'. ...read more. in the "best interests" of patients who could not speak for themselves, such as newborns, disabled, people with Alzheimer's disease and those disabled by a stroke. Doctors however must first judge against a set of criteria whether the patient is benefiting from being kept alive. John Harris (Nursing Times 1995) argues that killing is wrong when it involves depriving someone of something he or she values. Therefore, if a person requests death because his or her life is no longer valuable to him or her, voluntary euthanasia would be unjustified. However, this argument could not support involuntary euthanasia, as only the person deprived of life can decide whether or not its quality is still valuable to him or her. 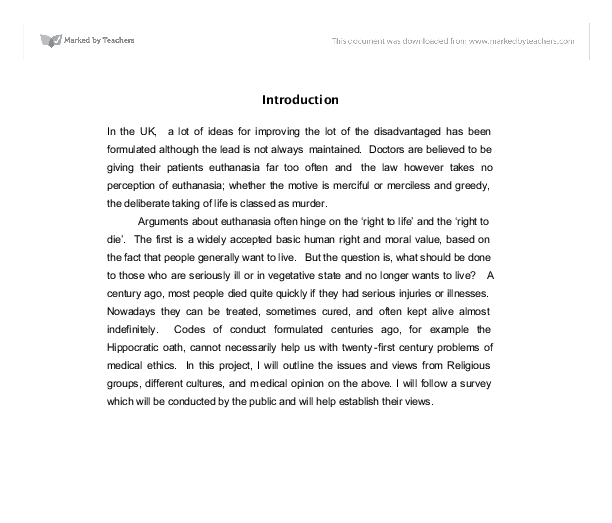 Summary In conclusion, while recognising the importance of individual patient autonomy, history has clearly demonstrated that legalised euthanasia poses serious risks to society as a whole. We also need to recognise that requests for voluntary euthanasia are extremely rare in situations where the physician emotional and spiritual needs of terminally ill patients are properly met. Doctors on the other hand have power over their patients, which must not be abused and so if they become killers, patients would become afraid to go into hospital. As from the information gathered, the doctor may be most helpful when asserting the value and the meaning of life, when that has been lost to the patient or those around him or her. Introducing death therefore is a very major change and so to my opinion, legalisation would bring about fear and further anxiety to the already tense situation of serious illness especially to those with disabilities. I do feel that it is our responsibility to meet the real needs of the terminally ill and not to justify an opinion or to support a position. Each individual is different, and needs a different answer. We need to get alongside people and to respond to the challenge of their specific life-situation with life-affirming responses. Death is no answer to any need. ...read more. It states that if voluntary euthanasia were permitted then so would follow involuntary euthanasia i.e. if people are allowed to have help in suicide then following would be people taking the choice for someone with no clear indication that it is wanted, much like Adolf Hitler's regime against the Jews. out whether a person's age or gender or religion can affect their view on Euthanasia. The death of a loved one may have a major affect on a person's opinion of Euthanasia and whether or not they believe it should be legalized. Australia Euthanasia is now illegal in Australia although it was once made legal by the Terminally Ill Act 1995. These laws were overridden by the 1997 euthanasia Law Act. Exit international are constantly campaiging for changes but television adverts were banned before they were aired. case where high doses of pain relief are used with the sole purpose of comforting the patient, which, coincidentally shorten the patient's life. * Withdrawal of treatment : this could be the denial of food or hydration. This could mean turning off the life support machine if the patient's life was depending on it e.g. To what Extent was Hitler&amp;amp;#8217;s Euthanasia policy a distinct &amp;amp;#8220;Nazi&amp;amp;#8221; Policy? According to a letter, the people were unaware at the time that they would be going to their imminent deaths.6Although the T4 personnel tried not to arouse suspicion, this was however inevitable as there were thousands of deaths of institutionalised people and other similar death causes. This report is mirrored across the globe. 64% of American's believe that a doctor should be allowed to end the life of a patient who has a painful and terminal disease if they wish to die, from the Roper Poll. However there was a case where the doctor said he had a "moral problem" in killing a patient, and so the parents took the doctor to court. Why is Euthanasia such a controversial issue? To legalise Euthanasia will put disabled people at the risk of being killed. It would divert efforts and would discourage people with disabilities to live independently and efforts to find a for cure diseases. We should expect doctors to treat illness and diseases and disabling conditions ? to cure not kill.